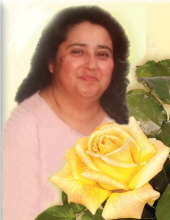 Cheryl Arlene Vigil Valdes of Gardner, Colorado entered into rest March 18, 2019 in Colorado Springs, Colorado. She was born in Walsenburg, Colorado, to Jake and Emma (Duran) Vigil on April 28, 1958. She was 60 years of age. Cheryl was preceded in death by her parents, as well as, her paternal and maternal grandparents. Cheryl graduated from John Mall High School (Walsenburg) in l977. She worked at the local Safeway store prior to her marriage. Upon marrying the love of her life, Robert A. Valdes, she moved to Vernal, Utah and later to Chama (Redwing), Colorado to reside on the Valdes' homestead. Cheryl and Robert began their journey of love and marriage forty-one years ago and together they had three children: Jared (Melissa) of Gardner, Tamara (Brad) of Colorado Springs, and Josh (Katie) of Walsenburg. She loved her children deeply and they were the beacon that illuminated her step of the way each day on her given journey. Her Grandchildren, Katlyn, Taryn, Treslyn, Trenton and the Grandchildren that entered her home and her life Kaitlyn, Karlie, Carter, Isabel and Lucas brought her great joy and a healing flow of encouragement that renewed her spirit daily. She loved the time they spent together and their conversations. Survivors also include her siblings: Tom, (Geraldine), Wilfred, Patricia, Debbie (Tom), Ron (Sharla), Jacqueline (Ted), and Richard (Loretta). She will be missed tremendously, but the love, joy, and experiences we shared together is priceless. Let your spirit soar freely, sing your sweet song, embrace your spiritual freedom, and walk along the path of peace, our beloved sister. Survivors also include numerous nieces, nephews, and cousins whom she loved sincerely. She also has her Valdes-in-law family, including: Loyola, Eva, Joann, Margaret, Erma (Carl), John (Rita) and Chris (Laura). Survivors also include special friendships: Leona, Veronica, Henry, Sarah, and Jenny as well as her life- long friends from near and far. Cheryl loved to garden, play tennis, listen to music and dance. She enjoyed living in her country home and sharing a meal with family and friends. Cheryl was led to discover a new frontier so enjoy ever lasting PEACE. A beautiful Memorial Mass was held at the Sacred Heart Catholic Church in Gardener Colorado. Monday March 25, 2019. Arrangements have been entrusted to the care of the Johnson-Romero Family Funeral Home. To send flowers or a remembrance gift to the family of Cheryl Arlene Vigil Valdes, please visit our Tribute Store. "Email Address" would like to share the life celebration of Cheryl Arlene Vigil Valdes. Click on the "link" to go to share a favorite memory or leave a condolence message for the family.